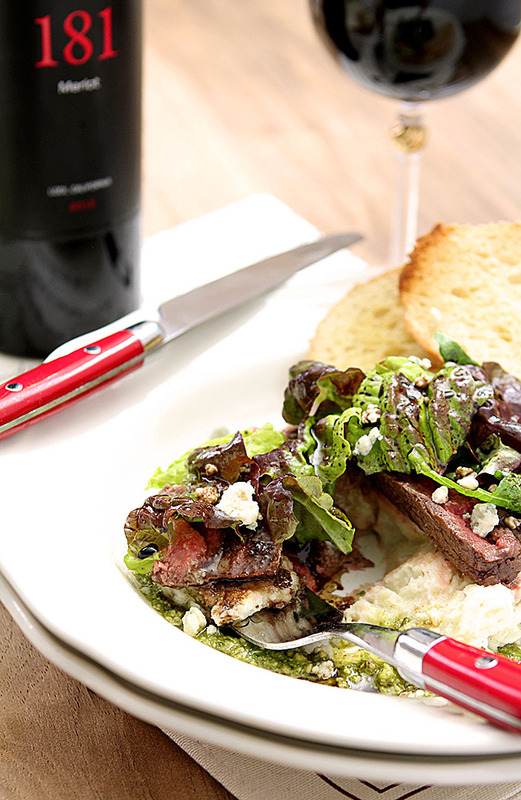 Steak Salad with Mashed Potatoes, Pesto and Gorgonzola Cheese is easy, delicious and makes a fantastic presentation. I originally posted this dish almost 6 years ago; so long ago that I had actually forgotten it was buried in the archives. It was a post celebrating my 15th year of putting recipes online, yikes! Not only posted a long time ago but not made since then either and that is just wrong. 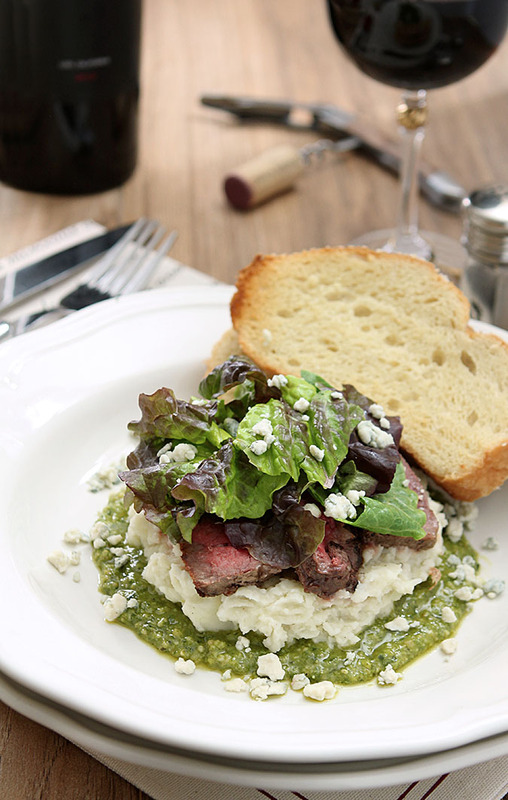 While working diligently to organize and clean up a lot of older posts, I discovered this one for Steak Salad with Mashed Potatoes, Pesto and Gorgonzola Cheese and was reminded of how amazing it was. Of course the photos were horrid and that was a great excuse to make it again. Maybe it goes against the grain of all things sacred for a Super Bowl Party too but it’s what I offered my guests this past weekend and it sure made things simple. No finger foods here, just this ‘Bisteca ala Panzano’s’ with my favorite margaritas and this FANTASTIC French Silk Pie with a bit of tequila and a hint of cayenne. Don’t scoff at that; make it. Then come back and tell me it isn’t one of the best pies you’ve ever had! 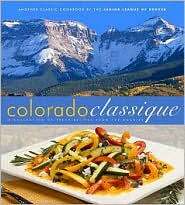 The recipe comes from Colorado Classique – the last cookbook from The Junior League of Denver. I’ve been collecting cookbooks from the Junior League since moving to Denver almost 28 years ago. I wanted something with local flavor and Colorado Cache, published in 1978, was my first and it’s still a favorite. It led me to my all time favorite Flank Steak recipe and was the start of my love affair with French Silk Pie (the original version). That first cookbook was spiral bound and I’ve actually had to replace it from so much use but the later versions are beautifully bound and photographed and Colorado Classique is no exception. Great photos abound along with a superb collection of recipes from hundreds of home cooks and 25 of the finest restaurants and hotels in Colorado. This recipe was provided to the authors of the book by Panzano’s Restaurant in Denver and carried the moniker of Bisteca ala Panzano’s. I checked and it’s no longer on the menu so I decided to name it something that more people might identify with but either way; it is so good I promise there won’t be another 8 year wait! I used my cast iron skillet to make this because my outside grill is still covered with snow. Truth is sometimes I simply prefer working inside. I will grill in the cold but can’t really say I love it and once I realized that my large cast iron skillet would serve me better if I just left it on the stovetop, I use it almost every day. It does a fantastic job of creating a great crust on the outside of steak; so much so I wonder sometimes if I don’t prefer that to the outdoor appliance especially when said appliance requires dressing for 20 degree weather! While I typically make this recipe from scratch in the summer when I have fresh basil, yesterday I did something to make it even easier. I spied a little container of pesto my neighbor Amy had given me from a huge jar she had bought at Costco so there was no homemade pesto to be made. It was so good and beyond easy and I think a jar of that pesto is in my future. After that it was just a question of grilling the meat, making some simple mashed potatoes (really want to make it fast? Costco has packaged mashed potatoes too!) and then layering the components. So easy and so good and best of all? My guests reaction to this decidedly not football game food. They announced they are so over finger foods and LOVED this way more. Perfect for Sunday suppers sure, but such a pretty presentation might also make this the dish you need to make someone for Valentine’s Day. I promise, they will love you forever. Cook in salted water til fork tender about 15-30 minutes depending on the size of your potato pieces. Drain and either put through ricer or use potato masher til no large pieces remain. Add butter and milk. Combine thoroughly but do not over-mix. Season with salt and pepper, cover and set aside. Grill the steak to desired temperature. I had 1 inch ribeyes and I grilled them for about 4.5 minutes on each side for medium rare. Let rest before slicing. Toss mixed greens with olive oil and balsamic vinegar and add salt and pepper to taste. Spread some pesto on the bottom of 4 dinner plates; covering about 5-6" in radius. Place a large scoop of potatoes on top of pesto; spreading out but leaving some pesto showing. Place a couple of slices of steak on top of potatoes. Top steak with greens and Gorgonzola. Wow, this looks like a wonderful meal in a bowl, like something you’d find in a fancy bistro! So smart to repost something so delicious! This is my kind of salad…the kind that is way more than a salad and the flavor combo is my favorite! Now this is my kind of lunch — you make it look so tempting I want to dig right in! What a beautiful dish that satisfies all the senses! And you are right about the Colorado Junior League cookbooks. There is always something to be found in there! Get that grill going. I can smell it from here! Looks like a delicious combination and a beautiful presentation! Thanks Ann; it is definitely both! 15 years is amazing. What an accomplishment. I would love to eat that plate of gorgeous food! Why it took me six more years to make it is a mystery because I want to do it again today. Totally delish combination of ingredients but I love that it makes such a pretty plate too. Why don’t you post more of the Jr. League recipes? No reason…I cook what I feel like cooking and post what we’ve enjoyed; I feel no special need to use those books more than other resources. Sweetheart, first or fifteeth, what counts is that you are here and doing a fab job! Your cooking talent is amazing! Your are kind, generous and funny (a hoot!) and I am so happy that i can count you as a true friend. Happy Birthday and many many more! And this bisteca looks fabulous! Yum! I love community cookbooks like this one. Thank you…love you back from across the pond! Thanks for visiting…and it was great chatting with you on Twitter too. Was privliledged to have the original and boy, was it delicious! Just made a variation and it was great too! Okay, so the Mondavi is affecting my spelling!! Wish I had some of the Mondavi! You’ll have to let me know what you did as a variation. That looks good! I like that it is a whole meal all stacked up in one. Thanks Kevin…made for a great lunch dish for a crowd with only one plate to serve from, that’s for sure. Thanks for stopping by. 15 years 🙂 I won’t tell you how old I was 15 years ago. Love the giveaway! Probably in school like my kids! I’m sure I was cooking before you were born. Really! Can’t be your 15th anninversary, that would make you over 30. Looks like a fabulous cookbook and this recipe is now on my menu for this weekend. Planning to open Cabs all weekend for the many friends stopping by. I love you too! Found the recipe so simple and yet so good. I mean, I had the dish for both lunch and dinner that day and would have probably done breakfast the next morning if there had been any leftovers. I think it’s a perfect company dish; I didn’t worry about the heat of the ingredients…that sure helped! I highly doubt that you have been doing this for 15 years, since that means you started this in Junior High Home Economics class. But I’m going to venture the guess 15 years. Please let the dog be the judge, I’ll take my chances with her. Beside I sprayed liver on this post. Think she’ll notice? Jim – Compliments will get you everywhere! But considering I have a 26 and 30 year old daughter I was definitely in Home Economics at the time but the real deal, not Jr High! It’s your 15th anniversary of food blogging…hears to many more great years ahead! Great looking cookbook and wonderful steak dish! That’s true; when I think of helping my Grandma in the kitchen before I was 10 I’ve been cooking for…oh my; a LOT of years! Signed up for the RSS feed…I’m looking forward to your next entry! I’d say this is your first and you have many years of experience and knowledge! Oh heart break…I am a Colorado Native who got lost on the way to the Kentucky Derby and have now been in Louisville KY for 26 years. I have the first two, not sure I knew there was a 3rd, Colorado Colore so now I need it and the new one. Love living vicariously reading your blog which I am a new subscirber. Grew up in Harvey Park/ Bear Valley area in Southwest Denver. This is your first anniversary of the blog but you have been posting recipes elsewhere for many years. Happy Anniversary! You are certainly in a gorgeous part of the country. Have driven through Kentucky a couple of times when I lived in NC and went home to St Louis prior to a move to Colorado almost 25 years ago. You know firsthand what an amazing job they do; I’ve never seen another Junior League cookbook series that compares! Glad to have you onboard. I’ve in SE Denver near the Tech Center…seems I was coming this way about the same time you were heading to Bluegrass country. I love it here but that area of Kentucky with the horse farms spreading for miles and miles…just amazingly beautiful. !st it is. That’s exciting. I think it would be the 15th Anniversary. Congrats! ..and i just became a fan on facebook! 1st — our League just finished our 2nd cookbook! …and I just tweeted about the giveaway and this FAB recipe! Its the first 😉 but you’ve been around for a longgggg time! And I’m definitely an RSS subscriber. It’s your 1st…no it’s the 15th….well, it’s whatever you want it to be! I choked when I saw you mention the JL cookbook – I’m from Denver and have been gone for almost 10 years – and STILL miss it. Plan to move back one day soon, but in the meantime, I’d be happy (or happier) with the cookbook – didn’t even know about this one! BJ, It’s a wonderful book…but then I seriously think they all are! And it’s a wonderful city…and can’t say that about all of them! I moved here from NC (though from St Louis) and was heartbroken leaving the place where my kids were both born and some amazing friends; but I could not leave Colorado, ever. Good luck…and if you don’t happen to win, I’m sure the Junior League would be more than happy to have you order one from their website! Yes. Yes, that would be me. 😉 And Al Gore. and of course I’m a fan!!! Plus I did a RT – Congrats big time on your anniversary!!! Congrats, happy anniversary and thank you for including us Canucks in the giveaway. Of course; I’ve made too many Canadian friends on Twitter to not include you! Wow, love your site. Saw your comment on 101 Cookbooks about high altitude baking/Colorado… I am in Southern Colorado so I had to pop over to see your blog. Will be adding your site to my favorites and will subscribe by email! Noticed the tab on High Altitude cooking/baking. Great stuff… thanks! Another blogger in Colorado? Doing a happy dance! Too few and far between; I keep kidding I’m going to do a Southwest Food Bloggers Conference. Someone asked what that was. I said couple folks…my backyard! Nice to meet you as well. Looking forward to seeing more great stuff on your blog. I couldn’t decide between a cooking/baking blog or a knitting blog (my latest passion); I opted for the latter. If your are interested, please come visit at http://www.kimsknittingkorner.blogspot.com. A recipe or two finds it way to my blog as well. I think it’s both! It’s your one year anniversary of vinolucistyle – and your 15th anniversary of blogging … WOW! Congratulations on both !! Just started following you on Twitter (thanks to Smith Bites for introducing me)! Happy anniversary! Thank you…I ‘Like’ that answer! I just subscribed by email (and I meant to do it before now!). I follow you on Twitter! BTW, that looks like a fabulous cookbook! I say you were a trailblazer! Happy 15th anniversary! Thank you…I have a couple of trailblazer stories too. Worked for cable company in new Internet (huh, what’s that?) Division in 1994. Meeting and discussion centered on our department being charged with the feasibility and/or development of a cable modem to deliver the Internet to home users. And…was building websites before Mr. Gates thought he should develop a browser; it was all Netscape; all the time! Ok, I am hungry for that and it’s only 10.30am!!! Awesome giveaway for your 15th blogiversary! Thank you…they are WONDERFUL cookbooks…good luck! Well 1st of all Congrats on the 1yr Anniversary ! I am @mom2apreemie and I was fortunate enough to be invited into @vinoluci home and was able to taste this fabulous meal first hand and all I can say is “Superb”!!! My mouth has been watering ever since. I can’t wait to make this salad for my family. I had a wonderful time that day and have made some wonderful new friends. Thanks again for the wonderful hospitality my friend @vinoluci. Beautiful looking salad! Interesting…with the potatoes. 😉 Anything with pesto, though, has my name all over it! Not really a salad per se…more a main course with a sprinkle of lettuce on top? I liked the fact while potatoes and meat were warmish, they did not have to be HOT, so it was a perfect dish to prepare for a group and serve outside without worrying a bunch about the temp of ingredients. oh. my. godie. i can’t even string a coherent sentence together about this recipe – steak, POTATOES, gorgonzola, PESTO . . . seriously, the next time you make this, could you just give me a call? i’ll book the next flight to Denver! and i’m a collector of cookbooks well but must admit, have never seen any junior league cookbooks – but i want this one so i’m hoping the dog picks me . . . and remind her that i’m a huge fan of spaniels . . .